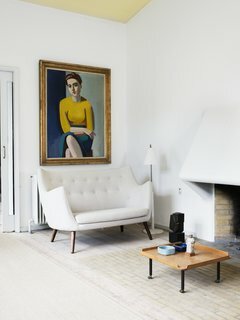 The home that legendary Danish architect and designer Finn Juhl designed for himself in 1942 remains unchanged since his death and is a fascinating snapshot of the golden age of Scandinavian Modernism. For Juhl and his midcentury modernist contemporaries, ornament and formality were less important than the real-life functionality of objects and spaces. To be modern was to be practical, understandable, and well made. Constructed of structural brick, Juhl’s open-plan home is composed of two "blocks" that meet at a right angle and frame the garden. Although each room of the home has its own clear function, it is possible to look from one room to the next as you move through the house—a design feature that creates a sense of spatial connectedness. The many large windows Juhl specified allow natural light to enter into each room of the house, all year long, while providing broad views outward into the garden as it changes with the seasons. 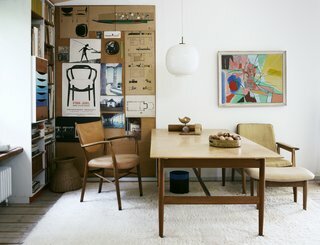 At the forefront of what makes Finn Juhl’s House so inspiring is the highly personal selection of practical and artistic objects he chose to collect and display throughout his home. "Finn Juhl was a well-traveled man," explains Sara Hatla Krogsgaard, "and he drew inspiration from everything, including the carpets, paintings, drawings, and sculptures created by his friends and contemporaries. He was constantly moving around the furniture in the house and rearranging art and objects in different ways." This flexible, organic, and evolutionary approach to interior design was central to Juhl’s modernist philosophy, says Krogsgaard: "The simplicity of choosing the things you love the most and then letting them stand out is definitely a key takeaway from the Finn Juhl House." 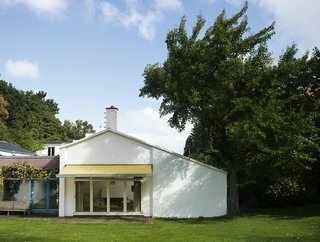 The exterior of Finn Juhl's house. Open shelving allows light to fill the living space. When asked about the reactions of people visiting Finn Juhl’s House for the first time, Krogsgaard smiles. "We often get really detailed questions about the chairs, the carpets, the exact colors of the walls, oh, and everybody wants to know about Vilhelm Lundstrøm’s portrait of Hanne Wilhelm Hansen [Juhl’s second wife] that hangs over the sofa." But the most interesting visitor comments, Krogsgaard says, "usually sound something like this: ‘wow, I wish I lived here’ or ‘I wish my home felt like this one.’ " More than 75 years after it was built, the home of a twentieth-century Danish modernist is inspiring people to reimagine the potential of their own twenty-first-century living spaces and to discover the value of thoughtfully curated interior design." 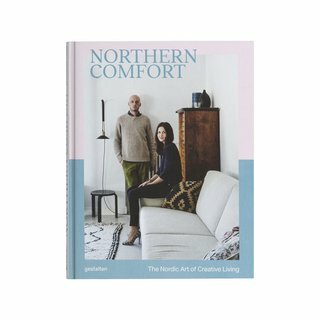 Northern Comfort takes a close look at some of the Nordic region’s most inspiring and insightful ideas and individuals. The Nordic Art of Life has become a role model for meaningful creative life around the globe.